There's a brand new iPad mini and it finally has a screen worth staring at. It's a (surprise!) retina display that'll make everything on the 7.9-inch screen look astonishingly clear. Along with the new fantastic screen, Apple's also equipping it with a speedier chip inside the same light and thin body of the original. But it costs a lot more. Just like the rumors suggested, the iPad mini 2's design looks strikingly similar to the original iPad mini. That's because it is, on the outside. It's made from the same anodized aluminum and has the same thin bezel. You'd be hard pressed to figure out the difference between the two generations of iPad mini until you see the screen. Oh the screen. After not including a Retina display on the original iPad mini, which had a relatively pathetic resolution of 1024 × 768 and 163 pixels per inch, the iPad mini with Retina Display will have a screen with double the resolution at 2048 x 1536 and 326ppi, the same resolution as the big iPad. That's a helluva lot better than before and should have been there from the beginning. It should look amazing. For reference, the 2013 Nexus 7 has a 7-inch screen with 1920 x 1200 resolution for a pixel density of 323 pixels per inch while the Amazon Kindle Fire HDX is similarly spec'd with a 7-inch screen at 1920 x 1200 resolution and 323ppi. 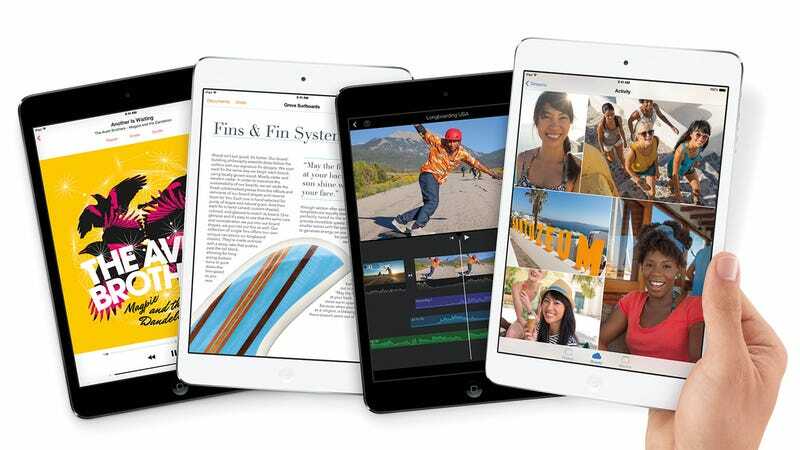 Like the iPhone 5S and the new iPad Air, the iPad mini with Retina Display will also be powered by the A7. That new 64-bit chip makes its CPU 4 times as fast as before and gives the iPad mini with Retina Display 8x faster graphics. The M7 motion coprocessor makes an appearance in the iPad mini too, but we'll have to see how useful that is in a tablet (as opposed to a phone you always carry around with you). The mini also has 802.11n Wi-Fi with MIMO tech to speed up Wi-Fi to 2x as fast. Apple says the new iPad mini will have the same 10-hour battery life we've grown accustomed to with iPads. It's a huuuuge leap in performance from the original iPad mini which has the A5 chip and sturggles with iOS 7. Basically, the original iPad mini had the performance power (and the same guts) of the iPad 2, released in 2011. This new iPad mini with retina display has the oomph and punch of the 2013-era iPhone 5S and iPad Air. In terms of performance, it's jumped two generations in one leap. The iPad mini has new colorful smart covers and smart cases too. $40 for the traditional smart cover and $80 for the full wrap around smart case. But there's a catch. To get all the improved guts and fancy new screen, the new iPad mini with retina display is more expensive! A lot more expensive. It'll run you $400 for a 16GB Wi-Fi only model and $530 for the LTE and Wi-Fi model. For storage size, you have the option of 16GB, 32Gb, 64GB and 128GB for $400, $500, $600 and $700, respectively. Tim Cook said the new iPad mini will be available sometime "later in November." The iPad mini with Retina Display will come in two color options, Apple's new white and black (silver and 'space gray'). Meanwhile the old iPad mini goes down to 300 bucks for a 16GB version (from $330).